The PO'M is always head-bunting my phone! We are ever so thankful for cat TUMMIES! "You may kiss my paw..."
"I'll do anything for some loving!" "This is my dramatic pose!" 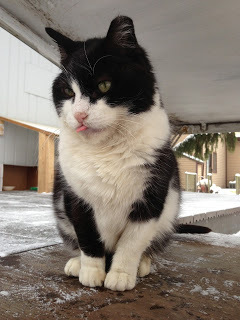 Neighbor cat Sly, who is the most photogenic cat! "Lady, I love to pose for you!" If you'd read my recent post, Bad Collared Cat Mom, you would know that we put collars on Manny (blue) and Chili Bruce (magenta) so we can tell them apart. I hated to do it, but it made calling each cat by their proper name much easier. Within days of that post, Manny removed his blue color, and removed it again every time I snapped it back on. He knew to bite the plastic clasp; I watched him do it. What a rascal, but since CB was still wearing his collar, all was well. One collar on, one collar off. Imagine, then, when I returned home from a long weekend trip to Indianapolis, Indiana with my friends, to open the door and start loving on the first black cat to appear...no collar, so it's Manny! Smooches and groping ensued, until the second black cat wanted some of that action too...and no collar! Whom was I kissing? The Hubby soon explained that CB had lost his collar 'sometime' during the days I was gone, and he just didn't bother with it. He claims he can 'mostly' tell them apart. The collars are obviously for ME, but they don't like them. Therefore, I must amp up my cat-identifying game now. CB is round in the body, while Manny is sleek. This will have to be my way of recognizing them. Or, I just call every black cat in the house "Handsome" or "Brother" or "Good Boy"! P.S. 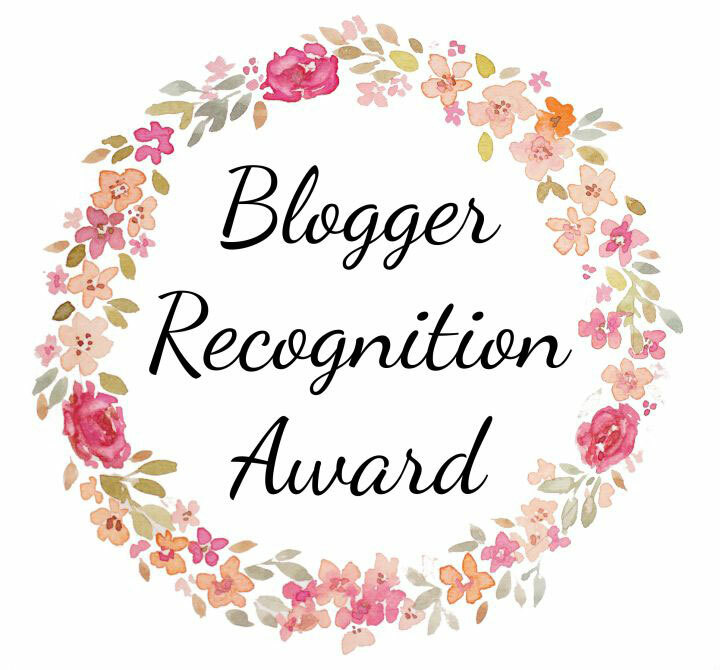 I'll visit your blogs soon as I catch up. You all know that The PO'M and I have a 'thing'. Luckily, The Hubby doesn't much care, nor does he worry about all of the smooches I plant on Paddy, or Manny Manfred or Chili Bruce. But, I have an affair going on that is beyond all of that! Yes, I'm talking about Zarathustra, the Mews and Almighty Gingermancat at FatCatArt. Having expressed my deep and abiding admiration for Z for ages now, I long to visit him in the fur. Image, to my great joy, finding myself placed in a painting with him! Oh, be still my beating heart! Yes, my friends, Z and me...whether he's got a cone on or not...he makes my heart go pitter pat! Thank you ET (you started all of this! 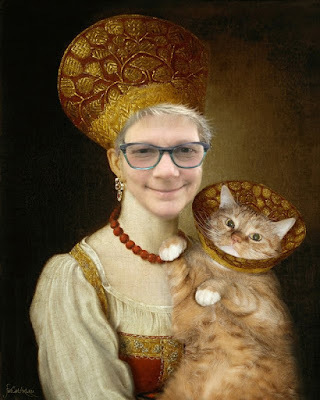 😹), and Sveta Petrova, the remarkable artist who actually lives with Zarathustra, and his sidekick David Bowie, who fans the flames of our great love by discovering new images of Z in classic artwork. Check out their website, and order a few items for yourselves. Chili Bruce loves the window in our downstairs bathroom, which is currently being remodeled. He wedges himself inside, even though there really isn't enough room for him. Don't worry, The Hubby has nailed the screen into the outside frame, so CB won't fall out...no matter how hard he pushes! ...to wedge himself in that window! We discovered that a nest of bumblebees took over 'Mama's House' shelter! I had cleaned out the old straw from The Cat Hotel, and was doing the same to Mama's House, when I saw bees flying all around me. 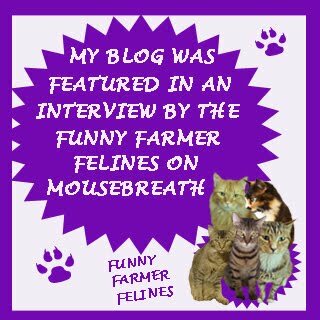 I stepped away, and then peeked over the edge and watched the furry, fat bees wriggling around in the straw! Just after dark, The Hubby and I carried Mama's House out the the back of our yard, and set it up on bricks so the bumblebees can continue their residency until it gets cold again. 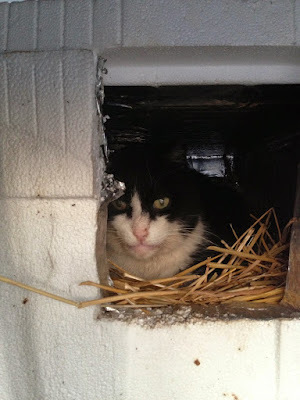 The PO'M and Sweetie only use The Cat Hotel, but I've kept Mama's House ready in case we had a new cat visitor or as a less-insulated, summer abode. Funny thing is, I placed a Bee House for native, non-hiving bees on the barn months ago, and we had a lot of visitors to that! The hollow bamboo is purrfect for bee nests! Am thinking about nailing up a few signs, "This Property Protected By Cat Bees!" BREAKING NEWS!!!! 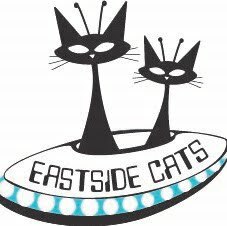 Name Changes at Eastside Cats! and the goofiest cat in the WORLD! Three names, because Chili Bruce Lee has three too! Image taken Sunday while he was asleep, but then he opened his eyes! And I'm this close (thumb and forefinger a wee space apart) to renaming Angel. She is living upstairs on her own, and only gets fussy when she can see her humans, or can hear us on the front porch. Angel is adorable, with soft, bunny fur, and both of us call her Baby or Cookie as often as we use Angel. 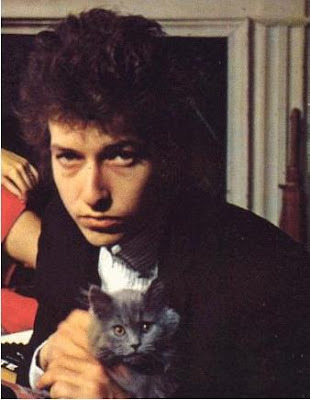 Everybody Must Get Stoned CATS! 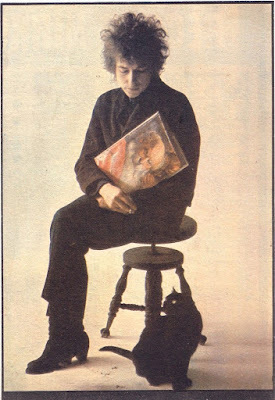 Labels: Bob Dylan, Everybody Must Get Cats! 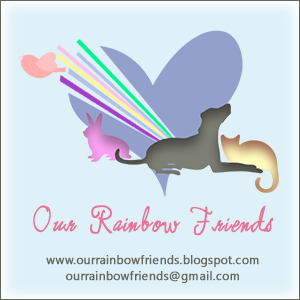 Our dear cat blogging friend ran off to The Rainbow Bridge yesterday. 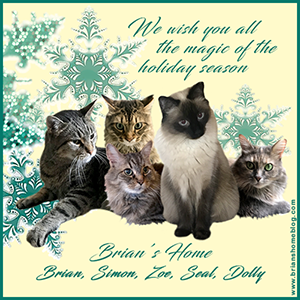 Please visit Cat-A-Holic's website, and leave a note. These two books couldn't be more different from each other! Yet, cats are a binding factor in each of them; their feline wiles twist and snake around the storylines, to become an important parts of the plots! I found both books by accident, by simply scrolling through the available MP3 audiobooks from my local library. Neither blurb mentioned cats, so my delight at finding them on almost every part of these stories was just remarkable. 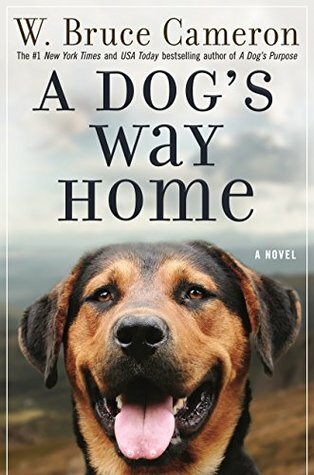 W. Bruce Cameron's, "A Dog's Way Home" highlights the trials that TNR (Trap-Neuter-Return) activists face daily; ignorance and dislike. Add a mother who suffers from PTSD after her service in the Middle East, and then mix in a stray dog who pushes everyone's lives onto new courses. But then Bella runs afoul of Animal Control in Denver, Colorado, and the story grabs you and keeps you in suspense! 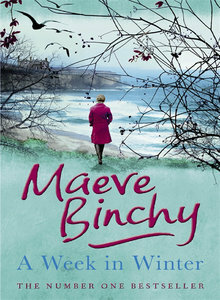 "A Week In Winter" by Maeve Binchy, weaves an Irish story of love and regret, transgressions and redemption, youth and hard-won knowledge, wrapped around an old mansion that is converted into an inn. And a wee kitten, named Sophia, loved by the elderly Queenie, moves through the mansion...and the lives of all of the characters in the book...while being a sweet, gentle cat. Like me, you all adore cats, and probably really enjoy a good story too! I highly recommend both of these books; they'll take you to places you've never been before, and into the minds and hearts of good people...and indifferent people, with a purring housecat, community cat clowder, or more (!) added into the mix. Patty O'Malley: "What did you call me?!?" 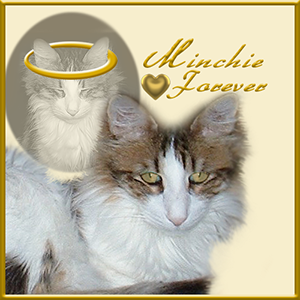 Angel Sammy left for The Rainbow Bridge four years ago today, and I miss him still. He wasn't well, and I tried hard to keep him with us, but he'd had enough and was ready to leave. The veterinarian said that his mouth was 'a mess' when I finally trapped Sammy, and carried him in for a dental procedure. She felt the kindest thing was to let him go, and as I looking into his eyes, he told me that it was his time. The veterinarian cried along with me, as Sammy drifted off to Heaven. However, I still have that twinge of guilt, because maybe we could have administered medicine, by mixing it with his food perhaps. At that time, neither of us had any experience with pilling or medicating cats, since Chuck wasn't diagnosed with his heart and kidney problems yet. And Sammy was feral, or the complete opposite of a house-cat. So, Sammy, I love you and miss you, and hope you can feel my affection for you. 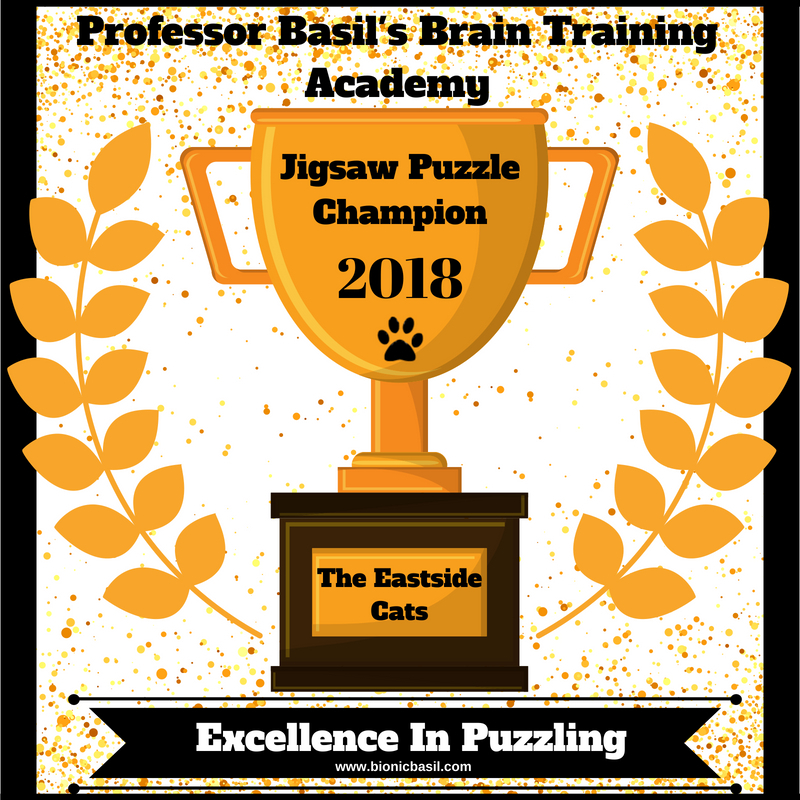 I had no idea there were online jigsaw puzzles, until Colehaus Cats offered one in a post a long time ago! I was instantly hooked, and have been enjoying a puzzle or two a day since. I use them as mini-breaks, instead of a smoke break or coffee break, during my work time. When asked to complete a jigsaw puzzle with an eye on the time it takes to complete, I yell, "GAME ON!" and put my nose to the grindstone. I have a few time-reducing tricks, and I LOVE to see the finished product. 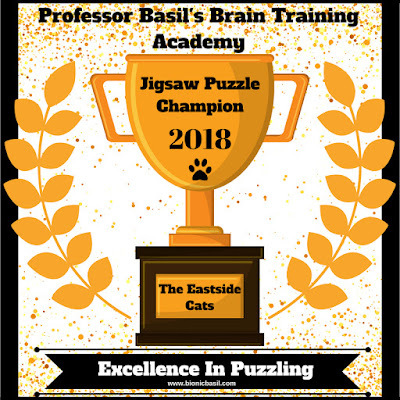 Image my surprise...and delight...to be crowned Professor Basil's Brain Training Academy's Jigsaw Puzzle Champion 2018! Oh, how much fun! Thank you very much; it's a labor of love, and you all have terrific puzzles for me...us...to play with. On a sad note, my corporate office has blocked my jigsaw puzzle websites as of a couple of weeks ago. They are considered 'game websites'. Therefore, I jigsaw only on my home Mac now. Alas and alack, but what can one do? Don't think I'm not going to defend my Champion title! It's still GAME ON! I certainly hope that Basil is doing okay; he's postponed his 16th Birthday Party because of illness. Feel better, Basil; we love you, and want to par-tay with you soon! I see plenty of cats while walking in my neighborhood. Wished I could blame my trip, fall, and busted hand bones on seeing a cat, but nope; it was plain inattention and heaved up concrete that caused that. I try to snap photos of the cats I see, whether in a window, or out and about. I am thankful that I have a bounty of kitties to engage my attention, plus the neighbors who I chat with, as I explain that I love cats but aren't planning on running off with theirs! The first photo was taken yesterday. A new cat in town! The second photo was from July 2017, of Stormy who was so curious about me! I learned the other day that he was very sick, and has crossed The Rainbow Bridge. He wasn't looking terrific that last time I saw him. Another neighbor explained weeks later that she too noticed that Stormy was ill, and she fed him a few times, then advised his owner that he needed veterinary care. Apparently, Stormy was euthanized. I'll miss the boy, since he walked up to me, meowing his little head off, and flopped down to allow petting. 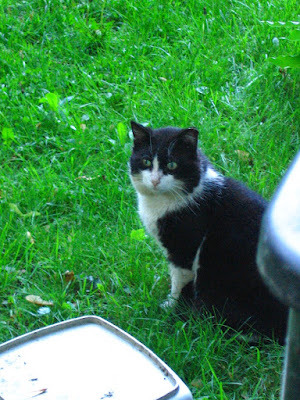 Farewell, Stormy; I am thankful that I got to know you! Yes, I feel like a rotten, poor example of a Cat Mom. I cannot tell Da Boyz apart since Chili Bruce lost his one white whisker, and although The Hubby claims he can...he's fibbing. I dug through my drawer of cat goodies (which includes unopened toys waiting to be doled out, half-empty medicine bottles, and flea and tick prevention packets), and I found the velvet safety Coolcatcollars that I posted about here last year. 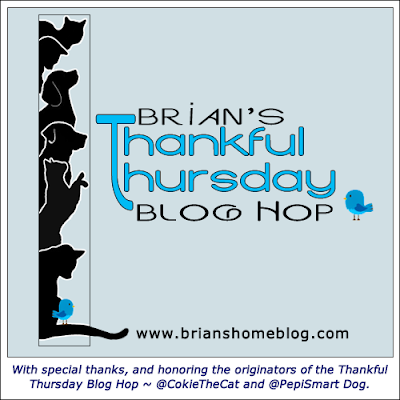 Manny is wearing the Blueberry Blue collar, and Chili Bruce sports the Rosewater Pink one. In the top photo of them sleeping, you cannot even SEE the collars! We put them on Da Boyz last night, and first thing this morning, I was able to call each cat by his rightful name without hesitation. And other than Manny giving his new collar a good scratch, both of them seem to be unfazed. What mother can't tell their babies apart? A unworthy one, that's for sure! Other than dyeing the tip of CB's ear (or bleaching it), this was the only solution I could think of. Manny has a big white spot on his belly, and CB's fur is silkier and his tail fluffier, and he's heavier than Manny. But I cannot pick them up to look at their undercarriage all the time, and two black cats next to each other at dawn or dusk are impossible...for me...to differentiate. The joy of having these two brofurs in our lives, outweighs my mortification at collaring them. They apparently don't care, and I now can tell one from the other. And don't go all 'pink is for girls' on us; we are an open-minded, fly-the-rainbow-flag kind of tolerant household! I'm with City The Kitty! My new Paws Unite t-shirt from City The Kitty! Folks, I am passionate about the end of declawing (technical term: onychectomy) both in America, and everywhere else that this cruel and inhumane feline surgery is performed. There are many groups that are on the forefront of this fight, and my two favorite ones are The Paw Project and City The Kitty. City recently came out with newly designed t-shirts, so I had to have one! I also received a sticker in the same logo. I paid for my purchase; no freebies here! This cause is too important NOT to give some $$ to it. 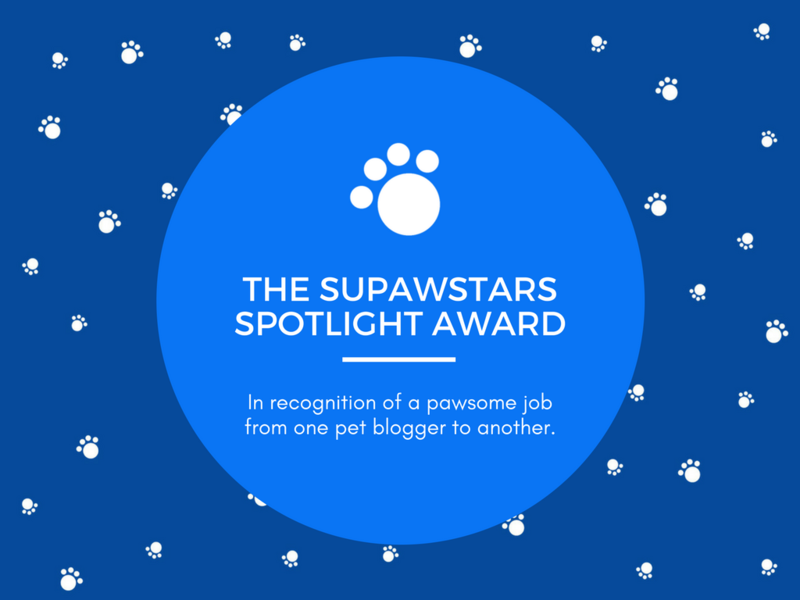 Every day, and in any way, I talk to people about the life-altering and painful procedure that declawing causes cats, and how veterinarian's should NOT be performing it. The argument that cats won't get adopted unless declawed is false; the statistics show that our shelters are full of declawed cats due to behavioral issues. Declawing does not put cats in homes, nor does it keep them there, and the cat is maimed for life. So now, I will wear my shirt, and hope it will start conversations. Some folks get very upset; they don't want to believe that they've knowingly harmed their cat, or that their trusted pet doctor allowed them to do it...and for a tidy sum, I might add. There are several professional veterinary groups who fight any legislation to criminalize declawing, and they have a LOT of $$ to throw at politicians. But right will win out someday, and we all can be a part of the process, by discussing the ramifications of declawing with friends and family, patronizing vet's who will not declaw (not many in Michigan, let me tell you! ), and supporting the cause in any manner that you can. 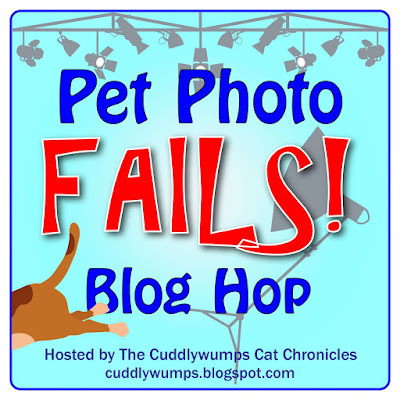 The Hubby gives terrific cat hugs, but he doesn't want to be on camera, so you'll just have to take our word for it. 1. & 2. are from 15 and Meowing, and 3. 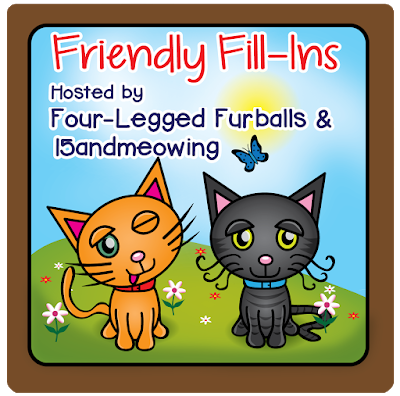 & 4. from Four-Legged Furballs. 2. The last thing I purchased online was _________. 1. My neighbors are pleasant people, who are okay with The PO'M and Sweetie hanging around our yard AND theirs. 2. The last thing that I purchased online was a City The Kitty Against Declawing t-shirt. 3. I have never shied away from speaking my mind regarding the abolishment of legal declawing. I talk to people on the street, in line at the grocery store, to friends of friends, and just about anyone. Do I make people mad? I try not to, but I suppose that I do. Do I care? Nope. 4. Anything is possible if you can envision it, and work hard to make it happen.